Dean Norton, director of horticulture at George Washington’s Mount Vernon, pulls out his cellphone and cranks up some Jimi Hendrix music as he walks toward the cannabis patch on the founding father’s estate. The “weed” is tall, planted in tight rows and has the serrated leaf edges of your classic ganja. While both contain tetrahydrocannabinol, THC, the substance that’s creates the “high,” industrial hemp contains only tiny amounts of THC and has no psychoactive effect, experts say. Recreational marijuana has roughly 10 to 30 percent THC in its dry weight of flowers, said Michael P. Timko, professor of biology and public health sciences at the University of Virginia. Industrial hemp has .3 percent or less. But the industrial strain, which was widely grown in colonial Virginia to make fiber for rope and other products, became lumped over time with the recreational strain. And both were stigmatized and suppressed in the early 20th century. Mount Vernon visitors are intrigued. Industrial hemp was an important crop in colonial times. A sailing ship could require thousands of feet of hemp rope for its rigging, Norton said. Hemp “is abundantly productive and will grow for ever on the same spot,” Thomas Jefferson wrote of it. Jefferson invented a special hemp “break” for processing it. He wrote that he used hemp “for shirting our laborers” — his slaves — because cotton was too expensive. He planted it in abundance, especially in one tract he called Muddy Hole. But it was a labor-intensive crop. It had to be pulverized, then soaked in water or dew, to help in the extraction. But when the process was completed, the fiber was long and strong. The idea to return hemp to Mount Vernon came from Brian Walden, 37, a farmer in Charlottesville, who got the notion after a 2014 federal law cleared the way for academic research into industrial hemp cultivation, he said in a telephone interview. Farmers were permitted to grow it if they joined a research program and partnered with a university that wanted to study industrial hemp, he said. He connected with the University of Virginia. He “donated land, equipment, expertise,” he said, and began to grow it locally. 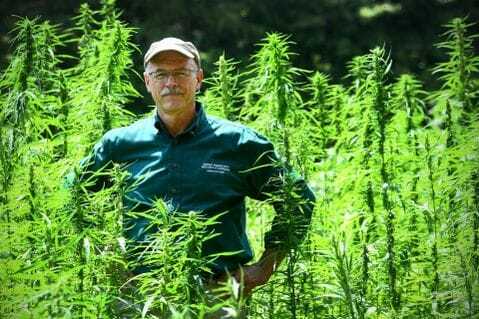 Last year, he came up with a hemp plan for Mount Vernon, to boost the crop’s image and illustrate its role in history. Norton was hesitant at first, but agreed this year. The first seeds were planted June 13. The 6o-day crop should be ready for harvest soon, Walden said. A similar plot has been planted at Montpelier, the Orange County, Va., home of founding father James Madison. But in the 20th century, with the rise of the recreational strain, all hemp became stigmatized. “They clumped them all together,” Walden said. In 1937, a huge “marihuana” tax was placed on hemp that “made every farmer drop it like a dime,” he said. But in the 1940s, some production returned because of the wartime need. In 1942, the Agriculture Department produced a 14-minute film, “Hemp for Victory,” urging farmers to grow it again. For the sailor and the hangman, it had been indispensable in the past, the narrator declared. Now it was needed for shoe thread, parachute webbing, and 30,000 feet of rope for every battleship.